Bootlin is proud to announce that it has contributed SPI NAND support to the U-Boot bootloader, which is part of the recently released U-Boot 2018.11. Thanks to this effort, one can now use SPI NAND memories from U-Boot, a feature that had been missing for a long time. A few months ago, Bootlin engineer Boris Brezillon added SPI-NAND support in the Linux kernel, based on an initial contribution from Peter Pan. As Boris explained in a previous blog post, adding SPI NAND support in Linux required adding a new spi-mem layer, that allows SPI NOR and SPI NAND drivers to leverage regular SPI controller drivers, but also to allow those SPI controller drivers to expose optimized operations for flash memory access. The spi-mem layer was added to the SPI subsystem by a first series of patches, while the SPI NAND support itself was added to the MTD subsystem as part of another patch series. Since accessing flash memories from the bootloader is often necessary, Bootlin engineer Miquèl Raynal took the challenge of adding SPI NAND support in U-Boot. Miquèl did this by porting the SPI-mem and SPI-NAND subsystems from Linux to U-Boot. The first challenge when porting the SPI-mem and SPI-NAND code from Linux to U-Boot was that the U-Boot MTD stack hadn’t been synchronized with the one of Linux for quite some time. Thus a number of changes in the Linux MTD subsystem had to be ported to U-Boot as well, which was a fairly time-consuming effort. The SPI NAND code has been imported in drivers/mtd/nand/spi, while the spi-mem layer is in drivers/spi/spi-mem.c. Once the core code was ready, we had to find a way to let the user interact with the SPI NAND devices. Until now, U-Boot had a separate set of commands for each type of flash memory (nand for parallel NAND, erase/cp for parallel NOR, sf for SPI NOR), and it indeed seemed like adding yet another command was the way to go. Instead, we introduced a new mtd that can be used to access all flash memory devices, regardless of their specific type. We will discuss this mtd in more details in another blog post. However, such a move to a generic mtd command forced us to do a lot more cleanup than expected, as we ended up reworking the MTD partition handling, and even making deep changes in the ubi command. This was more complicated than anticipated because of the SPI NOR support in U-Boot: it is not very well integrated with MTD subsystem, in the sense that there is a duplication of information between the SPI NOR and MTD subsystems, and when the duplicated information is no longer consistent, really bad things happen. As an example, any call to sf probe was doing a reset of the MTD device structure using memset, causing all other state information contained in this structure to be lost. Since the SPI NAND support relies on the MTD subsystem (much more than the current SPI NOR support), we had to mitigate those issues. Long term, a proper rework of the SPI NOR support in U-Boot is definitely needed. Some of those issues are present in the 2018.11 release and were discovered by U-Boot users who started testing the new mtd command. We have contributed a patch series addressing them, which hopefully should be merged soon. Now that those difficulties are hopefully behind us, the U-Boot SPI-NAND support looks pretty stable, and we have quite a few SPI-NAND manufacturer drivers in U-Boot mainline, with Gigadevice, Macronix, Micron and Winbond supported so far. We’re happy to have contributed this new significant feature, as it finally allows to use this popular type of flash memory in U-Boot. 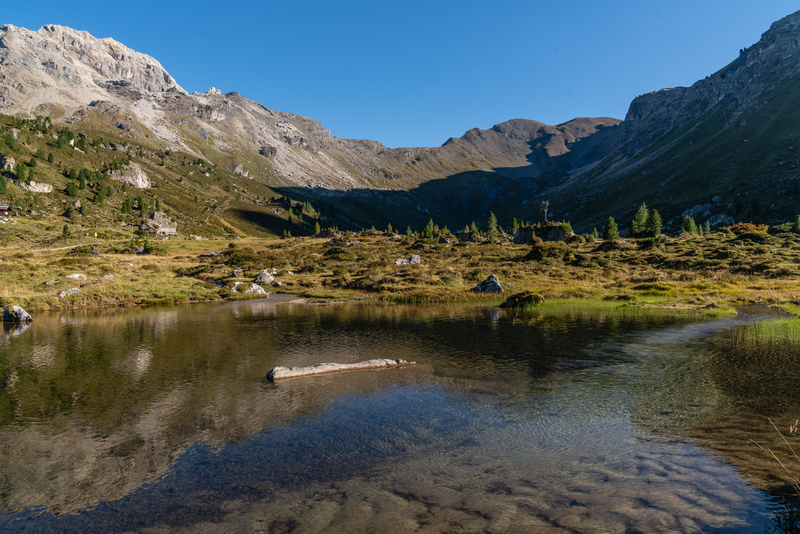 The second edition of the Alpine Linux Persistent Storage Summit (ALPSS) happened two weeks ago in the Lizumerhütte Alpine lodge. Close to Innsbruck, Austria, the lodge resides in an amazingly beautiful valley. Completely separated from the rest of the world in Winter, this year edition was marked by the absence of data network access, intensifying the feeling of isolation, stimulating the exchanges between attendees. 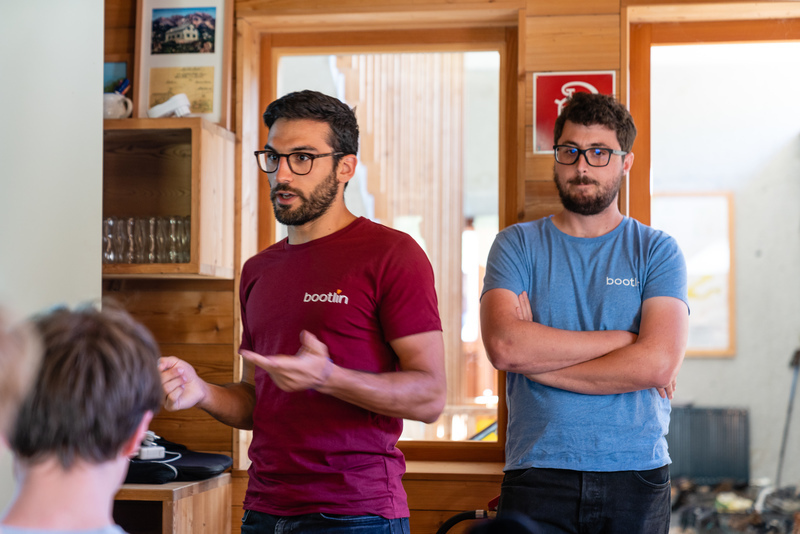 To strengthen the representation of MTD developers at this event, Bootlin sent two of his engineers: Boris Brezillon and Miquèl Raynal, respectively MTD and NAND maintainers in the Linux kernel. While almost all the ~30 attendees work on storage support that are based on NAND flashes, a majority work on domains targeting high-performances, where power-cuts are not the issue but the latency and throughput are. Far beyond our embedded world, people are working hard on the parallelization and the standardization of high-speed interfaces (SCSI, NVMe). In the end, we all have to make the software deals with the NAND-specific constraints of the underlying storage device. Disclaimer: This is a short summary (not exhaustive) of the “high-performance” world talks as we could understand them. This is probably not 100% accurate as the topics discussed are, currently, out of our domain of expertise. Corrections are welcome. Matias Bjørling (Western Digital) and Christoph Hellwig presented new NVMe commands to manage NVMe zones. While zones need write order to be preserved, the Linux multi-queue block I/O queueing mechanism (blk-mq) cannot enforce this. Bart van Assche (Google) and Damien Le Moal (Western Digital) proposed a draft to reorder writes at the blk-mq layer. While this solution was not very well received, it opened the discussion on how the issue should be addressed. Bart van Assche also presented his work on copy offload mechanism in Linux, which could for instance serve to fast copy entire zones. His work could be also useful to Stephen Bates who works on PCIe peer-to-peer and talked on how he wants to eg. enable DMA between SSDs. Still on the topic of DMA and performances, Idan Burstein (Mellanox) exposed the cutting-edge features he worked on to improve Remote DMA (RDMA) performances. Probably the easier part to understand for us, embedded people. Boris Brezillon and Miquèl Raynal gave a talk on their recent work support for SPI memories in Linux (and U-Boot, but this will be more detailed at ELCE in October). Boris wrote a new SPI-NAND layer, converting MTD requests into SPI exchanges, giving the flow of commands to the (also brand new) SPI-mem layer to standardize how to speak with SPI controller drivers from both SPI-NAND and SPI-NOR stacks. Cleaning work is still needed on the SPI-NOR side as well as the addition of new features like direct mapping, XIP (that was discussed after the talk), the addition of support for more chips and the conversion to SPI-mem of more SPI controllers. The slides are available online, see also our previous blog post on this topic. Richard Weinberger (from Sigma Star GmbH, and co-maintainer of MTD and UBI/UBIFS) updated us about the level of power-cut testing available to challenge the MTD stack. Tracing is possible to get closer to the failing sequence but one big problem is to replay the sequence and reproduce the issue. Tracking down untested code path is very important to keep UBI/UBIFS as reliable as possible: this is what is generally the most important when using SPI/parallel NAND devices. Richard’s co-worker David Gstir also works on UBI/UBIFS, but on the authentication side. Bringing filesystem authentication to UBIFS could have been simple but during his introduction he disqualified most of the alternatives he had (dm-verity, fs-verity, …). Fun-fact about fs-verity, authentication would have work on the file’s contents, but not on the inodes themselves. Hence, the file’s content could not be changed, but the file itself could still be moved. So, a brand new solution has been implemented for UBIFS, upstreaming ongoing. Benchmarking real hardware was somehow not adapted to Damien Le Moal experiments. He hacked QEMU to add the possibility to tune CPU latency so that he could compare easily the latency on in-memory data processing paths. WIP. Johannes Thumshirn (SUSE Labs), as a side project, started reversing APFS, Apple’s new filesystem. The firm promised two years ago to release the implementation of its filesystem so that computers running Microsoft or Linux could mount it. So far nothing happened, that is why, without even a Mac in hand, he started spending nights hex-dumping structures from a filesystem image he got, reverse-engineering the content with the help of research papers already produced. The first results are there, he can now ls and cat random files! A bit before the official BOFs time MTD folks gathered around Hans Holmberg (CNEX Labs) to carefully listen about how pblk works, a “Physical block device” FTL for SSDs supporting open-channel that could give ideas to some of them. Why not an entirely open-source SSD running Linux with its own FTL? Finally, between all the interesting discussions that happened, we could mention the need for a generic NVMe-oF (NVMe over Fabric) discovery protocol raised by Hannes Reinecke (SUSE Labs), and the possible evolution of the MTD stack to integrate an I/O scheduler to provide much better (and parallelized) performances exposed by Boris Brezillon. All attendees agreed this format of conference is really pleasant, the surrounding helping a lot to the general wellness and the success of this year’s edition of the ALPSS. We will definitely try to make it next year! Over the last months, Bootlin engineers Boris Brezillon and Miquèl Raynal have been working on rewriting the NAND controller driver used on a large number of Marvell SoCs. 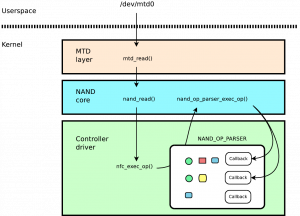 This NAND controller driver had grown very complicated, and Miquèl’s adventure in this rework led him to contribute a new interface to the NAND framework, in order to simplify implementing NAND controller drivers for complex NAND controllers. In this blog post, Miquèl summarizes the original issue, and how it is solved by the ->exec_op() interface he has contributed. 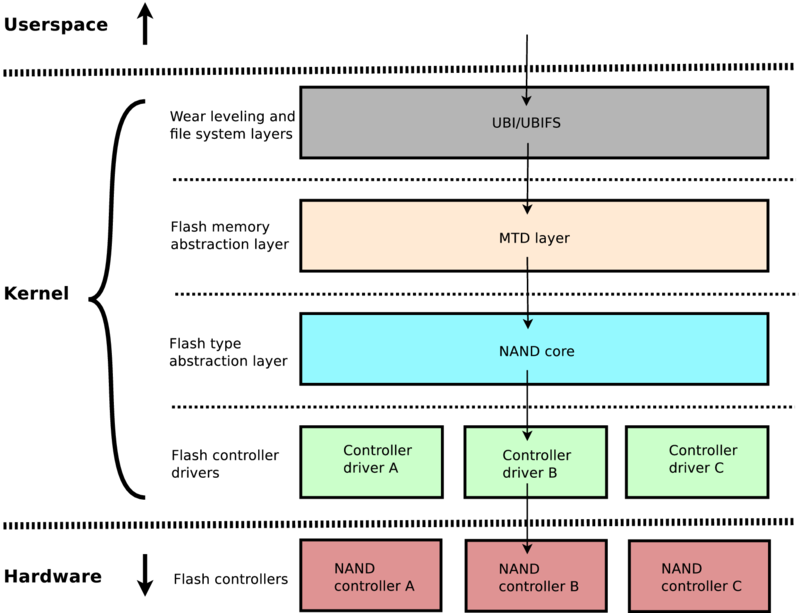 The NAND framework is the layer between the generic MTD layer and the NAND controller drivers. Its purpose is to handle MTD requests and transform them into understandable NAND operations the controller will have to send to the NAND chip. For general information about NANDs, the reader is invited to read the ONFI specification (Open NAND Flash Interface) which defines the most common NAND operations. Today, a majority of NAND controlller drivers implement the ->cmd_ctrl() hook. It aimed to be a very small function, designed to just send command and address cycles independently, usually embedding some very controller-specific logic. This hook was supposed to be called by a function of higher level from the NAND core, ->cmdfunc(). 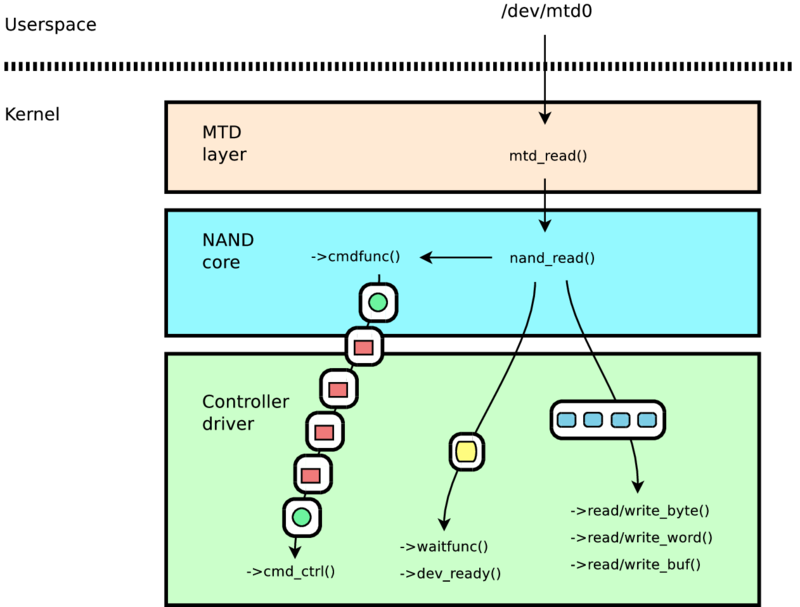 In addition to calling ->cmd_ctrl() to send command and address cycles, the core would also call ->read|write_byte|word|buf() hooks to actually move data from the NAND controller and the memory (the DATA parts in the diagram above). This approach worked very well with simple NAND controllers, which are just able to send command and address cycles one at a time to the NAND chip, without any extra intelligence. However, NAND controllers have become more and more complex and now can handle higher-level operations, usually to provide higher performance. 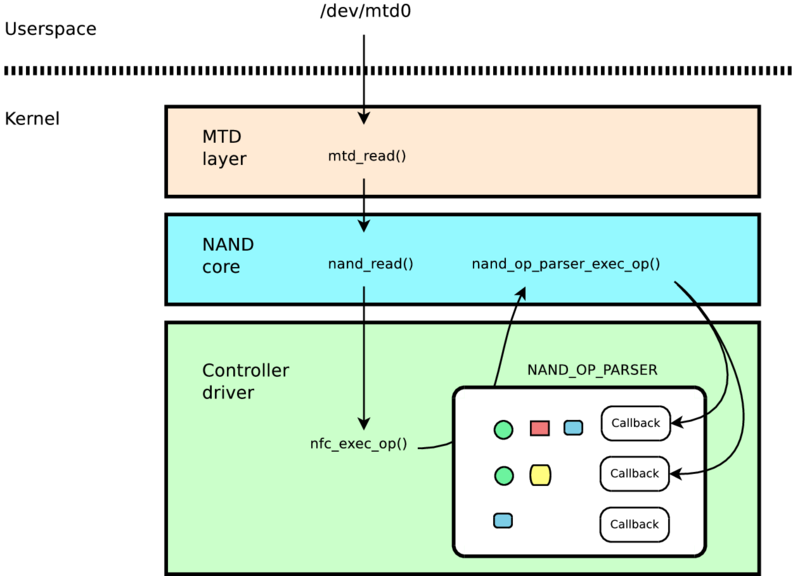 For example, a NAND controller may provide an operation that would do all of the command and address cycles of a read-page operation in one-go. Some controllers even support only those higher-level operations, and are not able to simply do the basic operation of sending one command cycle or one data cycle. To handle such controllers, their drivers were overloading the ->cmdfunc() hook directly, circumventing the generic NAND core implementation of ->cmdfunc(). This is a first drawback: it is no longer possible to easily add logic to the NAND core to support new NAND operations, because some drivers overload the ->cmdfunc() logic. Worse, ->cmdfunc() doesn’t provide some information such as the length of the data transfer, which some controllers actually need in order to run the desired operation. NAND controller drivers started to have complicated state machines just to work around the NAND framework limitations. Some driver-specific implementations of this hook started diverging from the original one, giving maintainers a lot of pain to maintain the whole subsystem, specifically when they needed to introduce additional vendor-specific operations support. These implementations were not only diverse but also incomplete, sometimes buggy and most importantly, developers had to guess the data that would probably be moved by the core after that, which is clearly a symptom that the framework was not fitting the user needs anymore. The NAND subsystem maintainers decided to switch to a new approach, based on a new hook called ->exec_op(), implemented by NAND controller drivers and called by the generic NAND core. 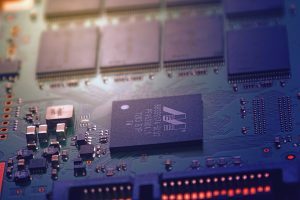 The logic behind that name is to provide to every controller a generic interface that can easily be extended and exposes the overall NAND operation to be performed. This way, the driver can optimize depending on the controller capabilities without the need of a complex state machine as ->cmdfunc() was. All major NAND generic raw operations like reset, reading the NAND ID, selecting a set of timings, reading/writing data and so on found their place into small internal functions named nand_[operation]_op(). From the NAND controller driver point of view, an array of instructions is received for each operation. The controller then needs to parse these instructions, decides if it can handle the overall operation, splits the operation if needed, and executes what is requested. Using the ->exec_op() interface is as simple as declaring a list with the controller capabilities, each entry of this array having a callback function knowing the overall operation that will actually handle all the logic. The NAND core was enhanced with a proper parser that one may use in his driver to handle the callback selection logic. For a more complete overview, one can check the slides and the video of Miquèl’s presentation at FOSDEM about NAND flash memories and the introduction of ->exec_op() in the Linux kernel. The ->exec_op() interface in the NAND core has been accepted and merged upstream, and will be part of Linux 4.16. The first driver converted to this new interface was obviously the NAND controller driver used on Marvell platforms, pxa3xx_nand. It has been rewritten as marvell_nand, and will also be part of Linux 4.16. Even though the new driver is longer (by lines of code) than the previous one, it supports additional features (such as raw read and write operations), allows the NAND core to pass custom commands to the NAND chip, and has a logic that is a lot less complicated. Miquèl has also worked on converting the fsmc_nand driver to ->exec_op(), but this work hasn’t been merged yet. In the community, Stefan Agner has taken on the task to convert the vf610_nfc driver to this new approach. Bootlin is proud to have contributed such enhancements to the Linux kernel, and hopes to see other developers contribute to this subsystem in the near future, by migrating their favorite NAND controller driver to ->exec_op()!